Mix, amazing on the vkuso-aromatic qualities, from flowers of a hibiscus, hips, raisin, pieces of apple, a papaya, berries of wild cherry and raspberry. 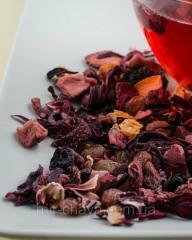 Bright, vitamin-rich and minerals drink will be to the taste to both adults, and children. It is equally pleasant as in cold, and hot. 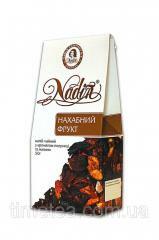 Unbelievable price on Tea fruktov_y in Kiev (Ukraine) company Tibest lyuks, OOO (Nadin, Nadin TM ). Tea fruit Impudent fruit, 50 g.
Tea a grass Breakfast on a grass, 50 g.
Tea fruit Impudent fruit, 0,5 kg.